Comments painted in pink included the remark that Wiesel, who died in 2016, was "in hell with Hitler". They were quickly removed. Wiesel became famous after writing about his teenage years in Nazi concentration camps. He devoted his life to ensuring Nazi atrocities would not be forgotten. 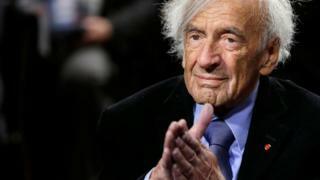 Police spokeswoman Florina Metes said officers were studying CCTV footage from the house, in northern Romanian town of Sighetu Marmatiei, where Wiesel was born in 1928. "This grotesque act represents an attack not only on the memory of Elie Wiesel but on all the victims of the Holocaust," said a statement by Romania's National Institute for Holocaust studies, which is named after the writer. In 1944 Wiesel's family was deported to Auschwitz, where his mother and one of his sisters were killed in the death camps. His father died at Buchenwald. Wiesel's use of the term Holocaust helped cement the word's association with Nazi atrocities against the Jews. In 1986, he was awarded the Nobel Peace prize for his role in speaking out against violence, repression and racism. After his death, the head of the World Jewish Congress said he was "undoubtedly one of the great Jewish teachers and thinkers of the past 100 years".